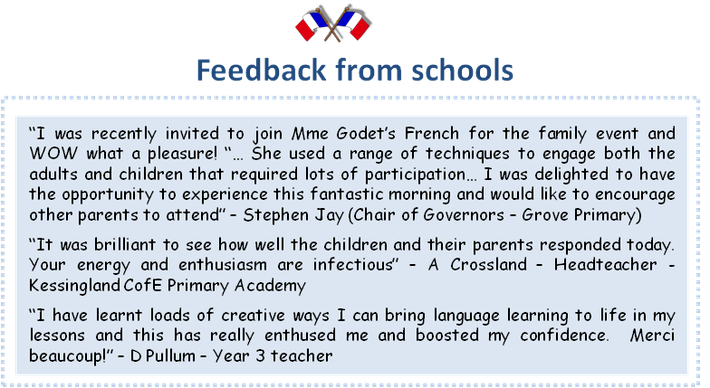 The French for the Family concept was designed by Mme Godet a few years ago and has been successfully delivered to a wide range of children in several schools in Suffolk. It provides parents with the opportunity to experience what it is like to learn a foreign language in school. A month before the event, a letter is sent home to invite up to 2 adult family members to come to school to learn French alongside their child. The aim of the session is for children and adults to work together - and support each other - whilst learning a new skill. The morning starts with a lesson during which all participants learn how to order food in French. This is followed by a Continental breakfast which provides an authentic context for learners to practise their new skills. Through mimes, songs, quizzes, games and role plays, the workshop encourages children and adults to work together to learn a new skill in a fun, relaxed and supportive environment. It focuses on the correct pronunciation of some key French sounds, introduces the notion of genders and provides all learners with the skills necessary to build up their confidence to communicate in French in a real-life situation. The session has been designed so that it is accessible to all learners, including those with little or no previous knowledge of French.